As an enhancement to the three-point seat belts, your Volvo is equipped with a Supplemental Restraint System (SRS). Volvo's SRS consists of seat belt pretensioners, front airbags, side impact airbags, a front passenger occupant weight sensor, and inflatable curtains. All of these systems are monitored by the SRS control module. 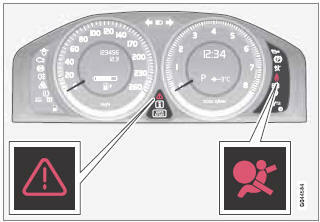 An SRS warning light in the instrument panel (see the illustration) illuminates when the ignition is in modes I, II, or III, and will normally go out after approximately 6 seconds if no faults are detected in the system. Where applicable, a text message will also be displayed when the SRS warning light illuminates. If this warning symbol is not functioning properly, the general warning symbol illuminates and a text message will be displayed. See also page 76 and page 78 for more information about indicator and warning symbols. • If the SRS warning light stays on after the engine has started or if it illuminates while you are driving, have the vehicle inspected by a trained and qualified Volvo service technician as soon as possible. • Never try to repair any component or part of the SRS yourself. Any interference in the system could cause malfunction and serious injury. All work on these systems should be performed by a trained and qualified Volvo service technician. If your vehicle has been subjected to flood conditions (e.g., soaked carpeting/standing water on the floor of the vehicle) or if your vehicle has become flood-damaged in any way, do not attempt to start the vehicle or insert the remote key into the ignition slot before disconnecting the battery (see below). This may cause airbag deployment which could result in personal injury. Have the vehicle towed to a trained and qualified Volvo service technician for repairs. 1. Switch off the ignition for at least 10 minutes and disconnect the battery. 2. Follow the instructions for manually overriding the shiftlock system on page 117.